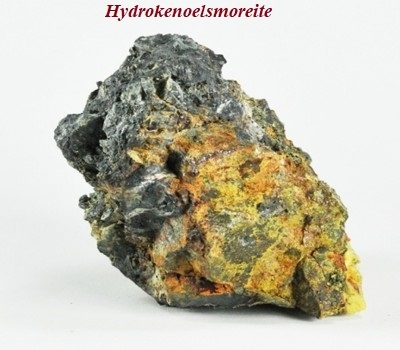 Hydrokenoelsmoreite is a hydrous tungsten oxide mineral with formula □2W2O6(H2O). It forms from the oxidation of ferberite within granitic pegmatite dykes and in pegmatitic greisen veins. It has a structure based on a defect pyrochlore lattice (A2B2O6O’). 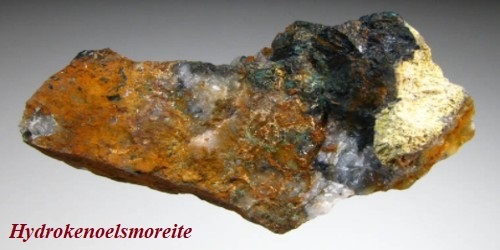 The mineral is a member of the elsmoreite group of the pyrochlore supergroup but deviates from the ideal cubic symmetry due mainly to the ordering of Fe3+ onto one of two W sites. Crystals are canary yellow, transparent with a vitreous luster, and have a pale yellow streak. Hydrokenoelsmoreite is a colorless to white, translucent isometric mineral. It has a Mohs hardness of 3, exhibits no cleavage and has a splintery fracture. It has a vitreous to adamantine luster. It is optically isotropic with an index of refraction of n = 2.24. It was first described for an occurrence in Elsmore Hill, New South Wales, Australia from where it takes its name.